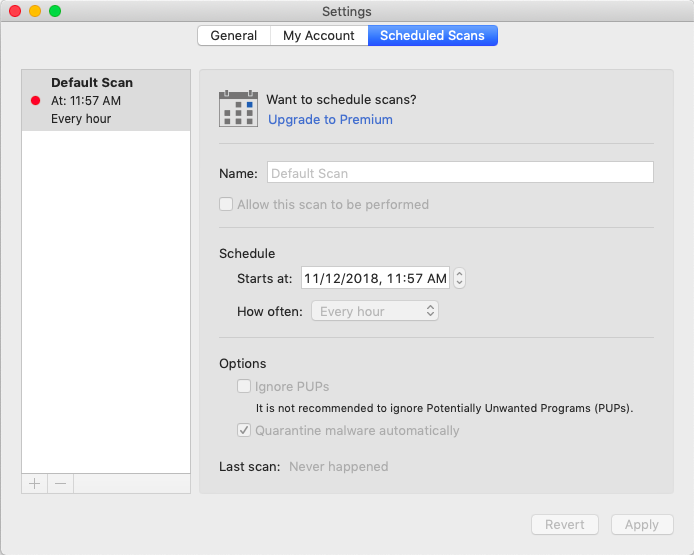 I recently noticed that with the latest update of Malwarebytes for Mac(Version 3.5.27) the default monthly scan is no longer active as it was intended to be for free users. I assume this is this either intended behavior or a glitch with the latest update that need a quick patch, as it happened on two of my mac devices... but i do believe that the free users of Malwarebytes are allowed to use a free monthly scheduled scan by default with only the option to change the day/time, according to the user guide. Is this no longer the case? The monthly scheduled scan for free users was removed. It will remain in the scheduled scan settings, but cannot be activated without a Premium subscription.